Home » filmmaking , holocaust , jerry lewis , movies , the day the clown cried , world war ii » "Jerry Lewis as a clown in a Nazi concentration camp!" "Jerry Lewis as a clown in a Nazi concentration camp!" Ahhh, Labor Day. The holiday consecrated to the common working stiff. The traditional end of another summer. The start of the final stretch of the year. And as most people know it's also the occasion of the annual Jerry Lewis Labor Day Telethon for the Muscular Dystrophy Association. Two things I'm compelled to say from the getgo: first, Jerry Lewis is one of the all-time greatest performers of stage and screen. And second, the Muscular Dystrophy Association is one of the finest charitable groups in the land. All of the money that's raised locally remains local and helps people in your own area. MDA has some of the least overhead of any organization of its kind. I've had a number of friends over the years that MDA has been there for, and has allowed them to know opportunities that they otherwise might never have enjoyed. So if you've some coin to spare, I'd like to urge y'all to donate to the Muscular Dystrophy Association. Okay well with that said, let me take advantage of this Labor Day to enlighten you, Dear Reader, of an aspect of Jerry Lewis' career that you might have never known... until now. Because for good or ill that's the sort of thing we do here at The Knight Shift. I had thought myself fairly well educated on the subject of the Holocaust in cinema. And my breadth of knowledge has not only covered Schindler's List, Europa Europa and the like but also the very real propaganda films of the Nazi government. I have seen Triumph of the Will. And I have also seen Jud Süß ("Jew Suss"): one of the most evil things ever committed to film. Along with very nearly every other movie and documentary pertaining to the Holocaust. But it wasn't until about two and a half years ago that I first heard about The Day the Clown Cried. It is a film that you have never seen and probably never will (unless you happen to be Jerry Lewis himself or one of those among his closest circle of friends and associates). The past few years has brought word that legendary "lost" movies like London After Midnight and the original cut of Metropolis may have been re-discovered and could soon see the flicker of light once again. But that is not likely to be the fate of The Day the Clown Cried. Produced in 1972 and since mired in international litigation regarding ownership issues, it will perhaps forevermore remain the most legendary movie never seen by a public audience. Maybe it's for the best. I'll let you be the judge. So what's The Day the Clown Cried a movie about? 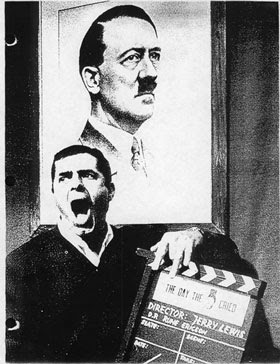 It's the synopsis that I'll never forget as long as I live: "Jerry Lewis as a clown in a Nazi concentration camp!" The Day the Clown Cried is about a washed-up circus clown named Helmut Dork (I swear, this is not a joke people) living in Germany at the height of the Nazi regime. One night while drunk in a bar he begins railing aloud against Hitler and the Nazis, and Dork is promptly arrested by the Gestapo. Poor Dork spends the next few years languishing in a camp for political prisoners, until he winds up making some Jewish children laugh with his antics. The prison commandant eventually puts Dork to work loading children onto train cars headed out of the camp. And then one day Dork accidentally gets locked inside one such car headed to Auschwitz. Upon his arrival Dork is employed by the Nazis as a "Judas goat"/"Pied Piper": entertaining the Jewish children even as he leads them straight into the gas chamber. At the end of the movie, overwhelmed with guilt and grief, Dork accompanies a group of children into the chamber and does his best to make them laugh. Their final moments are as happy as could be expected, before the Zyklon B lulls them into quiet death. This was supposed to have been Lewis' first "serious" movie. The script was first written by Joan O'Brien and Charles Denton in the early 1960s. Lewis was approached with the project and initially turned it down, believing it was beyond his abilities: "My bag is comedy... and you're asking me if I'm prepared to deliver helpless kids into a gas chamber? Ho-ho. Some laugh... how do I pull it off?" In the end Lewis fully committed himself to the production, winding up not only portraying Helmut Dork (as Jerry Lew-ish a character name as there's ever been) but also directing the film and co-writing the script. And then just before filming wrapped the money ran out and a very vicious fight over ownership arose (turns out that Lewis hadn't fully secured the rights to produce The Day the Clown Cried in the first place). And so it is that the movie has been tied in up legal limbo for almost forty years. "With most of these kinds of things, you find that the anticipation, or the concept, is better than the thing itself. But seeing this film was really awe-inspiring, in that you are rarely in the presence of a perfect object. This was a perfect object. This movie is so drastically wrong, its pathos and its comedy are so wildly misplaced, that you could not, in your fantasy of what it might be like, improve on what it really is. "Oh My God!" — that's all you can say." But of course, as with such things, there is no dearth of information to be found about it on the Internet. So if you are interested in learning more about The Day the Clown Cried I would recommend checking out Subterranean Cinema's VERY thorough collection of resources about the film (including an exhaustively researched article from Spy Magazine in 1992), as well as FilmBuffOnline's review of the script (which can be found quite easily across the Intertubes). Personally, having read the script: I don't see how The Day the Clown Cried would have been anything but a box office calamity. The screenplay is a very tired and tedious read, and the best editing isn't apt to salvage an outstanding product from the material. It's all just... irredeemably... wrong. But in spite of how taken aback and even a bit horrified I was after reading this, I do also believe that there might be a unique place for The Day the Clown Cried in the chronicles of cinema. Having been produced barely a quarter-century after the Holocaust, it's very obvious from the script that the arts and entertainment industry was still struggling to understand how to approach this most delicate of subjects. It would be several more years - many would say that 1978's television miniseries Holocaust began the trend - before Hollywood would start to fully grasp with sensitivity the scope of the Shoah. All films should be judged according to the period in which they were produced. So it is that for all the problems apparent with it, The Day the Clown Cried... regardless of lack of release... deserves to endure as a noteworthy entry in Holocaust literature and cinema. As much as for how not to make such a film as it is a benchmark of artistic courage to have even considered producing it at all. I will never watch the telethon and Jerry Lewis's singing "You'll Never Walk Alone" the same way again after reading this. How bizarre. damn..I remember seeing the TV DVD collection advertise plenty of times. Constant Gina, you're imagining things. Jerry Lewis has a videotape of the rough cut he keeps in his office, locked squarely away in his safe. He lets no one see it. It's never been released in any way.